>I realised the other day it’s been an age since I shared some of my new favourite products with you so that’s what you’re going to get this week. Hope that’s OK.
For the last few months, my skin has been awful dry and for someone who has only ever had combination skin at best, this has been extra distressing. Mainly because it means I’m old. Well, I am (whisper) thirty but still, it hurts. My lovely Philosophy Purity cleanser just wasn’t cutting it and so I turned back to my Liz Earle Cream Cleanser but still, it just wasn’t working out. And so I dug into the BeautyMecca box to see what I could see and lo and behold, hidden away was the Elemis Melting Cleansing Gel and Rosepetal Cleanser. I immediately stuck the cleansing gel in the shower and started using it in place of the Purity in a morning. The Rosepetal cleanser took over from the Liz Earle as a cream cleanser at bedtime, massaged into dry skin and removed with a hot cloth. I LOVED it. And more importantly, so did my skin. The consistency is a lot looser than the Liz Earle and it melted all my make up and daily grime right away. It also sorted my eye make up right out. The next morning, I busted out the gel cleanser. 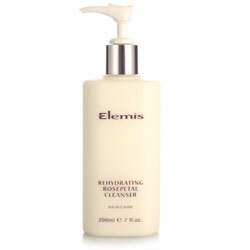 This is a really nice product, transforming from a pearlised gel to a creamy cleansing milk once on wet skin. It felt like I was getting a really great deep cleanse but my skin didn’t feel like it was stripped at all. I love the melting cleansing gel, it smells amazing too. Have you tried the Marine Dream cream? Such a great moisturiser.